Thirteen year old kids are just naturally smart alecks. It has nothing to do with TV, school bus education (the farther back you sit -the more you learn) or even rock music. It is a developmental stage that is ingrained in them and that is all there is to it. To wit. Jilly -bob and I were visiting the Sylvans, our dear Amish friends. Yes Amish as in No TV, No MTV, No Atv, No DVD and no e-l-e-c-t-r-i-c-i-t-y. A new calf had been born and Jilly-bob came running up to me and asked if we could take it back to our farm. Sylvan Jr., the 13 year old, said “Yeah Ann – why don’t you take it to your farm” to which I had to reply “Now Sylvan Jr. you know I don’t really have a farm”. Then with a true smart aleck smirk on his little face came this ” Oh I don’t you don’t have a farm – I just don’t know if you know you don’t have a farm”. 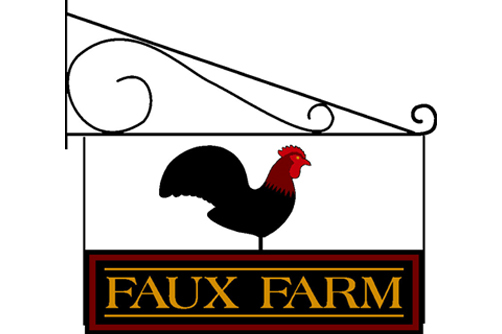 Therefore, in a tribute to all 13 year old Smarty pants out there my farm will forever more be known as “The Faux Farm” because even I know it isn’t a real farm. However, I don’t like to be reminded of it!